8/10/2017–HICKORY, NC–The Hickory Composite Squadron of the Civil Air Patrol held a change of command ceremony on Tuesday, 25 July 2017. In the presence of senior-level officers and distinguished guests, Lt Col Tony Wright passed off leadership of the squadron to Capt Andrew Meranda. Visitors in attendance included: Lt Col Joseph Weinflash, Chief of Staff to Col R. Jason Bailey, Commander of the North Carolina Wing, group commander Maj Jim Fitzpatrick, and members of the Gastonia Composite squadron, including its commander, Lt Derk Beutler. The ceremony was opened by Lt Col Tony Wright, who expressed his appreciation for the chance to serve as the squadron’s commander for the past five years. 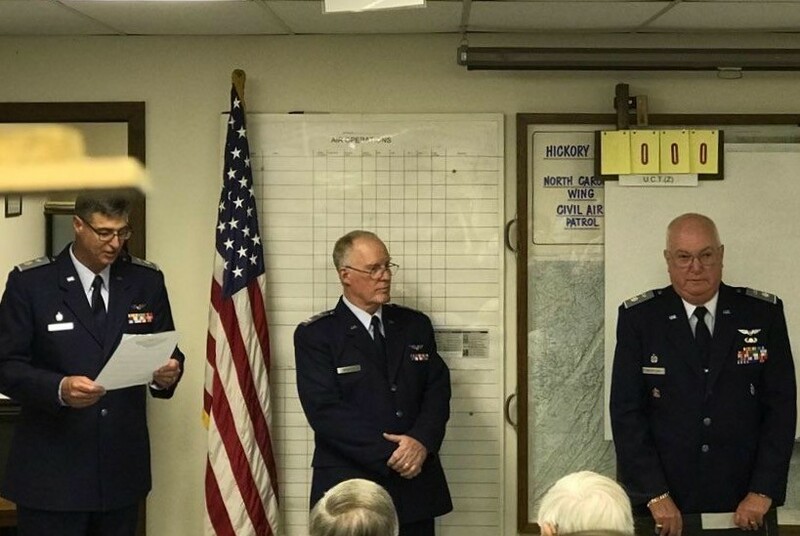 Group commander Maj Jim Fitzpatrick spoke briefly and presented Lt Col Wright with a Commander’s Commendation Award before Lt Col Joseph Weinflash delivered a stirring oration on the values of the Civil Air Patrol. Assisted by C/Cpt John Harwell, Lt Col Wright passed off the squadron’s guidon to Capt Meranda. Captain Meranda spoke about the unity and family atmosphere of the squadron and indicated that he looks forward to seeing the squadron advance its missions of emergency services, aerospace education and cadet leadership development. Following the change of command ceremony, C/Cpt John Harwell was presented with the Amelia Earhart Award. The Earhart Award is the third milestone in the Civil Air Patrol cadet program. To earn the award, a cadet must earn the rank of cadet captain, pass comprehensive leadership and aerospace testing, and successfully complete a rigorous physical fitness test. On behalf of the Wing Commander, the award was presented by Lt Col Weinflash, NCWG Chief of Staff. After the ceremonies, attendees enjoyed fellowship and refreshments. The Civil Air Patrol is the official auxiliary of the United States Air Force. The Hickory Composite Squadron meets each Tuesday evening from 6:30 to 9:00, and is located at 2900 2nd Ave, NW. The cadet program is open to cadets aged from 12 to 18. Visitors are welcome.